HORTEN, Norway, Jan. 31, 2019 /PRNewswire/ -- Kongsberg Maritime announced today that the EM 124 sonar, installed aboard the DSSV Pressure Drop, played a key role in the deepest solo human submersible dive completed by the Five Deeps Expedition. Expedition founder and submersible pilot, Victor Vescovo, reached the bottom (depth of 8,376 meters) of the Puerto Rico Trench in his private submersible the Limiting Factor following precision mapping of the ocean floor completed by the EM 124. The Kongsberg EM 124, released in 2018, is the fifth generation of a range of new multibeam systems from Kongsberg Maritime and is the successor of the highly accomplished EM 122, the de-facto standard in deep water multibeam systems. It is a modular, state-of-the-art multibeam echosounder that performs high resolution seabed mapping from shallow waters to full ocean depths (11,000 m) with unparalleled swath coverage and resolution. It has a broad range of functionality, including the simultaneous collection of seabed and water column imagery. This capability saves time and increases efficiency during the planning, execution and analysis phase of a mission. The low-noise electronics are compact and flexible in design for easy installation and integration into a vessel of any size. "This was the very first delivery of the EM 124 and has already proven to be a success with fantastic results," said Chris Hancock, vice president of sales for Kongsberg Underwater Technology. "The Five Deeps Expedition leaders and the crew of the DSSV Pressure Drop were excellent to collaborate with throughout the installation and commissioning phase of this project. Our expert technical team was able to optimize system performance and conclude successful sea acceptance trials just prior to the scheduled dive in the Puerto Rico Trench. Over the next 12 months, we will continue to work together and support the expedition remotely through our Mapping Cloud service." "The EM 124 is arguably the most advanced underwater sonar currently installed on a civilian vessel," said Vescovo. "It produced digital 3D renderings of the sea floor that were used to identify and verify the deepest point in the trench that ultimately determined the dive location. This was essential to the success of the mission." 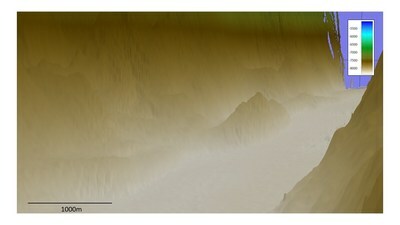 To learn more about the expedition, please visit www.fivedeeps.com. Kongsberg Maritime is the world's most trusted supplier of hydro-acoustic technology for a wide range of subsea applications supporting scientific, naval and offshore oil and gas industries. Kongsberg Maritime also offers a full range of autonomous underwater vehicles, unmanned surface vessels, naval sonars, infrastructure and sensors for underwater science and maritime communications solutions. About Kongsberg Underwater Technology Inc.
Kongsberg Underwater Technology Inc. (KUTI), a wholly-owned subsidiary of Hydroid, Inc. supports the U.S. government, leading research institutions and commercial survey companies with turnkey marine technology solutions. The company also develops, manufactures, markets and supports the Seaglider® AUV system. Located in the U.S. and a subsidiary of Kongsberg Maritime, Hydroid, Inc. is the world's most trusted manufacturer of advanced Autonomous Underwater Vehicles (AUVs). REMUS AUVs represent the most advanced, diversified and field-proven family of AUVs and AUV support systems in the world.